TRENDY SHOPS offer clothing, furniture, accessories. La Brea Avenue added sass and flash a few decades ago, but this past year the busy street saw an influx of spaces with a young, urban vibe. Much of the buzz is centered between 1st and 2nd streets, designated as District La Brea. The DC-based development firm Madison Marquette renovated the historic Continental Graphics building, and pursued edgy, hot designers. The result is a still evolving mix of trendy retail shops, restaurants and offices. Simple, striking jewelry abounds at Judith Bright, a Nashville-based designer. One fresh piece is the RockStar cocktail ring with a choice of gems in a gold-filled or sterling bird’s nest setting for $188 to $238. 177 S. La Brea Ave., JudithBright.com. Maroon 5’s Adam Levine and singer Christina Aguilera favor D.J. and local designer Kelly Cole’s rock ‘n’ roll flavored store featuring his line of men and women’s denim, over-dyed flannel shirts, and $80-$100 vintage concert tour T’s. 175 S. La Brea Ave., kelly-coleusa.com. 171 S. La Brea Ave., www.aplusrstore.com. Son of the eyewear designers who founded the iconic Oliver Peoples brand, Garrett Leight California Optical creates new and classic styles. A popular frame is the $260 “Hampton,” available in 10 colors, including matte sage and champagne. 165 S. La Brea Ave., garrett-leight.com. New York-based Steven Alan emphasizes shirting for men and women. Made from fine, imported fabrics, the designs appeal to stylish young professionals. Most popular is the $188 “reversing” shirt, with exterior seams. 123 S. La Brea Ave., steven-alan.com. South of District La Brea, Mix Furniture opened a second showroom for bigger pieces and outdoor furnishings. The eclectic collection includes $1,200 wood antique indoor/outdoor Indonesian daybeds, and $125 Moroccan mosaic lamps. 331 S. La Brea Ave., mix-furniture.com. Traveling north, upcycled furniture and industrial lighting is the purview of Cleveland Art. Artisans based in Ohio create new things out of old parts, such as a $2,500 table with a recycled metal patchwork top. Commercial clients include Ralph Lauren stores. 606 N. La Brea Ave., clevelandart.com. Representing contemporary established and emerging Los Angeles area artists, WallSpace is packed with accessible pieces, ranging from Sean Finocchio’s $75-$750 digital photo/ink prints on plywood to Rose Masterpol’s bold abstract oils for $12,000—$15,000. 607 N. La Brea Ave., wallspacela.com. JVB Interiors imports art deco to mid-century furniture and designs custom pieces. The rare Danish Safari sofa easily disassembles for portability on African adventures. Custom couches feature built-in Macassar ebony shelving. Gilded geode tables start at $6,500. 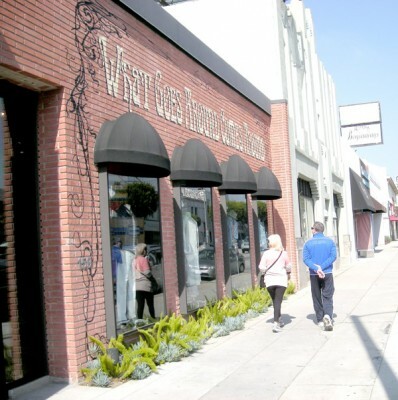 729 N. La Brea Ave., www.jvbinteriors.com. Feeling peckish after indulging in the rites of retail? Try one of these new food spots. Enjoy gourmet pastries, breakfasts, and lunch in the courtyard at Sycamore Kitchen. 143 S. La Brea Ave., thesycamorekitchen.com. Revive with delicious cold-pressed juices from Clover. 342 S. La Brea Ave., cloverjuice.com. La Brea Bakery’s new digs serves fresh-baked breads, sandwiches, salads, and soup. 460 S. La Brea Ave., labreabakery.com. Texas-Style barbeque and a full bar is a heartier option at Bludso’s Bar-&-Que. 609 N. La Brea Ave., www.bludsosbbq.com. If mobile eating is your thing, food trucks line up the second Saturday of the month.